To add new values to an enum, you should extend the enum. Any enum that is marked as Extensible (IsExtensible = true) can be extended. You can find the extensibility information in the Properties window in Microsoft Visual Studio, as shown in the following illustration. Range comparisons, such as <, >, and .. 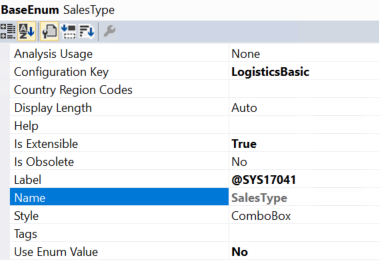 If the switch block doesn't have a default case block or a default case block that doesn't throw an exception, handle the extended enum value by subscribing to a delegate, if a delegate is provided. Otherwise, add a post-event handler to the method. If the enum is used in a switch that has a default case block that throws an exception, contact Microsoft to request a delegate. If the enum has an associated class hierarchy that handles the enum, create a subclass for the extended enum–specific implementation, and uptake the construct on the base class as required. For more information, see Register a subclass for factory methods. 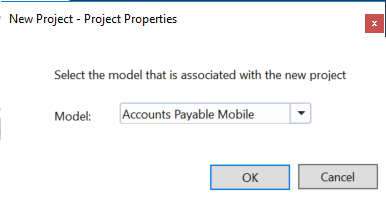 Create a project that has a model reference where you want the new enum extension. Right-click the enum to extend, and then select Create extension. 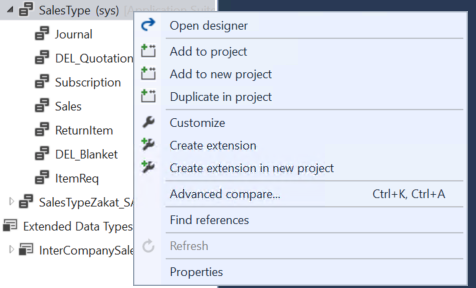 Right-click the enum to extend, and then select Create extension in new project. You're prompted to select the model that the extension enum should be created in. The enum extension is created in the selected model. You can add new enum values to this extension.